The Persian fallow deer (Dama dama mesopotamica) (gavazn-i zard in Persian) (Yah-mur in modern Hebrew) is a rare ruminant mammal belonging to the family Cervidae. Its taxonomic status is disputed, with some maintaining it as a subspecies of the fallow deer, while others treat it as a separate species, Dama mesopotamica. ↑ 1.0 1.1 Template:IUCN2011.2 Database entry includes a brief justification of why this species is of endangered. 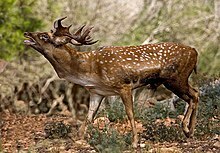 Wikimedia Commons has media related to Persian fallow deer. This page was last changed on 22 September 2018, at 16:45.